Upper Delaware Council Seeks Nominations for 31st Annual Awards by March 15 - Upper Delaware Council, Inc.
NARROWSBURG – The Upper Delaware Council, Inc. (UDC) is accepting public nominations through March 15 for its 31st Annual Awards Ceremony to be held on April 28 at Central House Family Resort in Beach Lake, PA.
Nine categories are available, in addition to the Oaken Gavel Award traditionally given by the Council to the past year’s chairperson. Nomination forms and a list of past award recipients are available on-line at 2019 award nomination form or upon request. The Sunday, April 28, ceremony will take place at the Carriage House facility of Central House Family Resort located at 81 Milanville Road in Beach Lake. Festivities will begin at 3 p.m. with an hors d’oeuvres and cash bar reception. A buffet dinner will be served at 4 p.m. The keynote address and the presentation of awards will follow. The public is welcome. Tickets are $28. Reservations with advance payment are required by April 19. Distinguished Service Award – Given to an individual who has acted with distinction in support of the goals and objectives of the River Management Plan for the Upper Delaware Scenic & Recreational River. This is the UDC’s highest honor. Robin M. Daniels Memorial Lifesaving Award – Given to individual(s) who, through an act of selfless heroism, saved the life of a person or persons in imminent peril in 2018. Community Service Award – Given to the individual, community, sportsmen’s or conservation group, or other entity that took action in 2018 to protect the river corridor, or one or more of its valuable resources. Cultural Achievement Award – Given to the organization or individual whose work promoted, enhanced, or interpreted the cultural resources of the Upper Delaware River Valley. Recreation Achievement Award – Given to an organization or individual that made an outstanding effort to educate river users about such subjects as water safety, conservation, litter control, river etiquette, and property rights. Outstanding Community Achievement Award – Given to a municipality to recognize significant action in 2018 to protect the river corridor. Partnership Award – Given to a government agency or regional entity instituting new programs or policies, or engaging in cooperative ventures, in support of the River Management Plan. Volunteer Award – Given to the individual or organization who contributed significant time and energy in 2018 in service of the Upper Delaware River Valley. 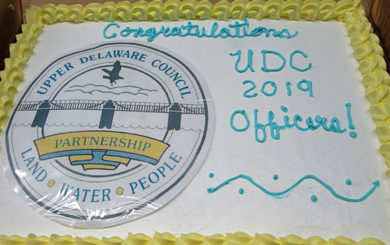 Award(s) of Recognition – Given to those who have made substantial efforts in the past year to improve the Upper Delaware’s quality of life and resources. Nominations will be evaluated by a UDC subcommittee. The list of this year’s honorees will be announced in late March. For more information on nominations and reservations, please contact the UDC at P.O. Box 192, 211 Bridge St., Narrowsburg, NY 12764, phone (845) 252-3022, fax (845) 252-3359, or e-mail laurie@upperdelawarecouncil.org.